It’s worth noting that the aim of the #ChartStorm isn’t necessarily to arrive at a certain view but to highlight charts and themes worth paying attention to. So here’s the another S&P 500 #ChartStorm write-up. 1. The Euphoriameter: First up is a look at what’s down and that’s the Euphoriameter, it has fallen 0.31 pts off the high, and while it remains elevated, we have seen a clear reset here from what were arguably too frothy levels. The big open question remains whether this is the peak or just a pullback, and for now it looks like a pullback. 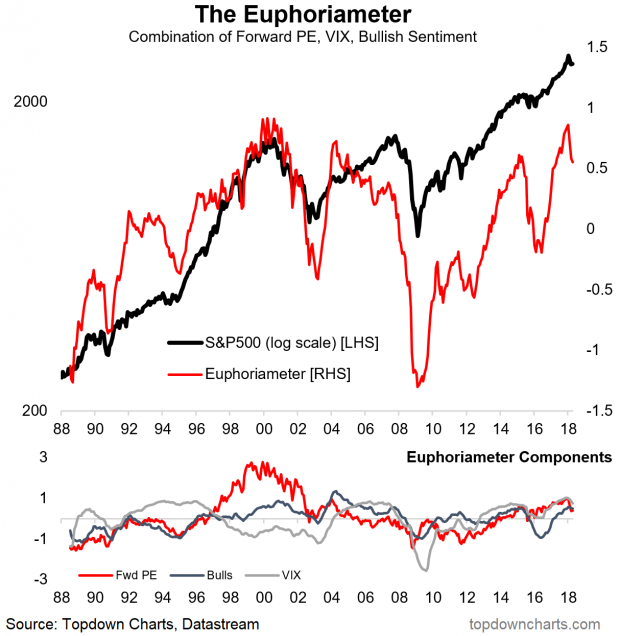 Bottom line: The Euphoriameter has reset from frothy levels. 2. The Investor Movement Index: On a very similar track, the TD Ameritrade “Investor Movement Index” has likewise seen a reset, in this case a much more substantial reset. So we are certainly building up the view and evidence that there has been at least some clean-out in sentiment – the next chart also adds to the case. 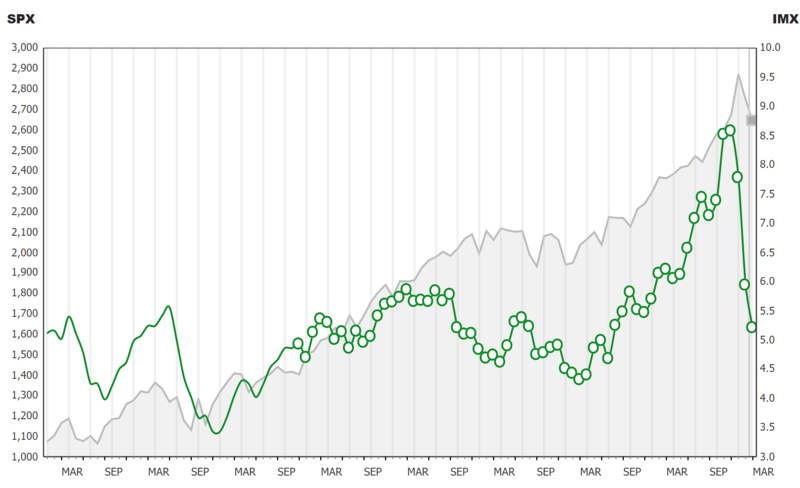 Bottom line: The investor movement index shows a reset in investor sentiment from extreme levels. 3. 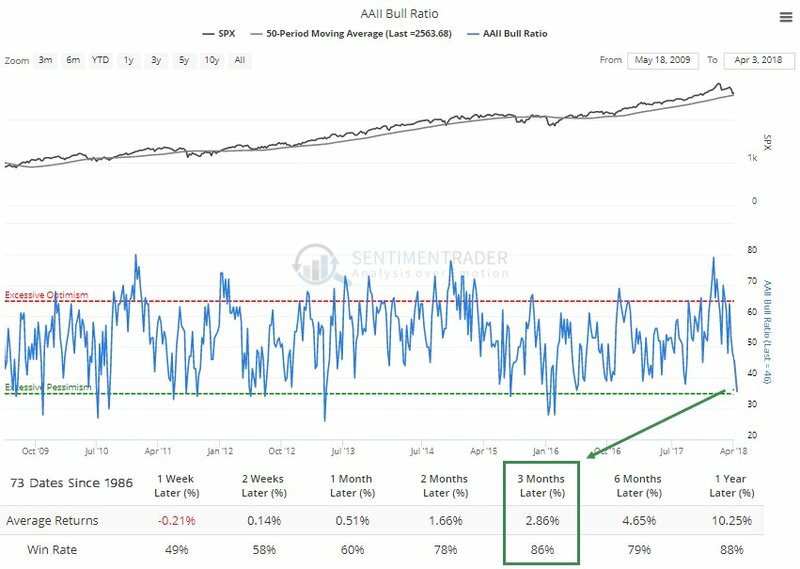 AAII Survey: This chart from the ever excellent Sentimentrader shows bulls vs bears ratio from the AAII (American Association of Individual Investors) and the bottom line is that it has reached the bottom end of the range. My rule of thumb when I think about sentiment is that through the range it carries momentum information, and at extremes it carries contrarian information, and as you might guess I would say at this point it is carrying contrarian information… i.e. investors have switched over from too optimistic prior to the correction, to now too pessimistic. Lines up with the overall picture of a clean-out/reset in sentiment. Bottom line: The AAII bull/bear ratio has gone from too optimistic to now too pessimistic. 4. Valuation Reset: On the topic of resets, Jurrien Timmer of Fidelity Investments shows how the forward PE ratio has undergone a reset (while also showing that market expectations of Fed rate hikes are little changed… perhaps another way of saying the macro picture hasn’t really changed). Part of this is down to the fall in stock prices, but part of it is also down to the increase in forward earnings as analysts have factored in the impact of tax cuts and the bullish broader macro backdrop for earnings.